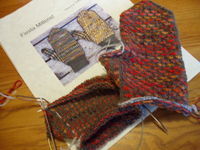 In addition to the mittens, I also worked on the men's socks this past weekend. The holiday season MUST be in full swing! My needles have mittens, socks, a baby sweater AND my cardigan on them. What's up with that!?! It's true! I have mittens to share with you this Monday. In preparation for our Turkey Day travels I rummaged through the stash and found a solid that would go with the Koigu handpainted. I've wanted to try Lucy Neatby's Fiesta Mittens for awhile now and they are so much fun to knit! I'm thoroughly enjoying them. Caryn recently knit them and came up with her own thumb design. I may try it with a different pair. And, there WILL be more pairs. 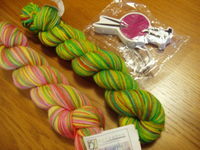 Friday, I picked up these two skeins at Needlework Unlimited in Minneapolis that are earmarked for Fiesta Mittens. One skein of this and one of solid and voila! Oh, and the needles and ball of yarn are actually an antenna topper...how cool is that!?! It's going to be a Christmas present...as are the mittens...so shhhhhh...don't tell anyone. Okay!?! Happy Thanksgiving!!! (A couple of days late.) I hope that you had plenty to be thankful for and family and friends to be thankful with. After the Big Feed, there was plenty of time for knitting and geocaching. You'll have to wait until tomorrow to see the knitting...hey, you've waited this long, you'll survive. After all, I checked and a WHOLE lot of bloggers took the weekend off as well. 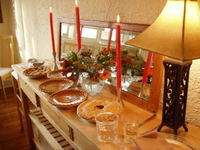 Sorry everyone...no Web Wednesday links today...I'm busy getting ready for Thanksgiving. No turkey to cook, no pies to bake, and ABSOLUTELY NO green bean casserole will EVER be made by me. No, I need to decide what knitting to take along in the car and for the post-turkey down time. 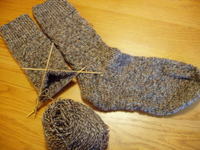 The first sock is completed, so I'll take the second sock along. 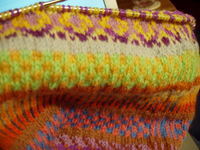 I'm thinking a pair of mittens will finally jump up onto my needles too. For those of you in the US, don't overindulge...it'll make you too sleepy to knit. For those of you who don't celebrate Thanksgiving, have a good day and work and join me in being thankful for health and happiness. The return of the car sock....it's a good thing. That's right, today was a day for waiting. Waiting means knitting. Waiting to pick the kids up from school. Waiting for the van oil change...a solid hour of knitting. As I prepare for the holiday ahead, I wonder how many of you are hitting the road. What knitting will you take with you? Will you knit around the relatives? Will it keep you sane enough? Since we missed going out the past two weekends, there was no stopping us today. Even the fact that this weekend was opening weekend in WI for deer hunting couldn't stop us. The fact that KC is not wearing blaze orange should give you the hint that we were in an urban forest. Give us enough credit to stay out of woods that are filled with hunters! The season have definitely changed. Look at those LONG shadows...it's NOON for crying out loud! But it is also perfect weather for hats, scarves, mittens and sweaters. Unfortunately, NO progress was made on any knitting yesterday. Panda and I went to Chicago to IKEA. I didn't have a driver so the six hours in the car were completely void of knitting. 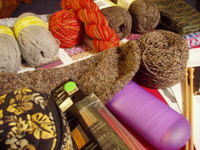 Oh well, the coming holiday brings TEN potential knitting hours (and some geocaching to work off that turkey haze). My crazy week is nearly finished at work. Tonight is the unveiling of the new wine. It also marks up the wrap up of what is known as "plans week". 24 more hours and then I can catch up! Imagine how nice it was to arrive home one day this week (I'm not even sure which day) to a note from Robin in the mail. With the note were these fabulous tea themed stitch markers. What a pleasant surprise. Thanks Robin! Speaking of tea...coffee is actually my preferred source of caffeine. So imagine my surprise when I discovered that I missed the opportunity to sign up for the Knitters' Coffee Swap. I would have loved to have their button on my blog. Maybe instead of sour grapes, I'll just pour myself another glass of ripened grapes. Web Wednesday: Creatures small AND great! Tangelled Angel found a great calendar at her local Borders. Hunting for a site to order it myself Further inspection revealed an entire SheepWorld website. It's a German site, but if you click the British flag, the site will translate to English. Wild and wacky (and may I add tacky!?! ): Thanksgiving Turkey Hat. Talk about a headdress!!! There's even a matching tea cozy. All thanks to Catirina Bonet Designs. There are some interesting (and some bizarre) knitting designs. A friend has asked me to make her a tea cozy...I may send her here first to get an idea of what she does (and doesn't) like. Speaking of wild and wacky...two news stories from our area...the first is the story of fainting goats. Make sure that you click on the "watch video" option. You really need to see this one! 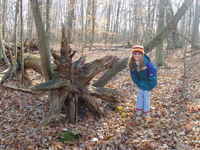 The second story is a report of Bigfoot. (This one you won't need to watch the video of...there's nothing to see, yet.) It seems that we have a "migratory" Bigfoot in our area. Who knew? While we're on the subject of animals and wild video....here's the photo and the video is for a Dutch (I think) milkshake dairy product. I just want to see how they managed to get that cow in the sidecar to begin with!! Late edition: Franklin has a new ornament for this holiday season....these are my favorite creatures (as is Franklin!). 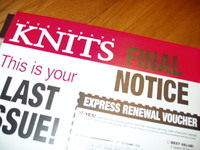 Must NOT renew Knitter's Magazine. I will not allow this to be my last issue. I appreciate that Interweave Knits has classic as well as trendy styles in their magazine. Plus, there is generally at least one sock pattern in an issue. I have written Knitter's magazine (by XRX publishers) and told them that in the past year there have only been 3 designs that interested me (one was a sock). I'll check it out in the LYS and make my decision to purchase based on whether or not there are designs that I like. Sorry but, just like their changes to Stitches Midwest, I'm not crazy about the XRX changes to their publication. But things are fixed now (both at work and in the knitting). Time to move forward and take the lessons learned with me.